Encanto Beach Club Bar and Grill – Offers guests a unique open-air experience with coastal Mediterranean cuisine perfect for lunch or dinner right on Dorado Beach. Something in the distance rises above the sand, mirage-like, shinning sun, subtle breeze, and the irresistible, vibrant colors and activity is Encanto, where pleasant scents of Mediterranean spices will guide you through a culinary journey where you will savor Mediterranean cuisine with Caribbean soul. Great food, refreshing and carefully curated cocktails, local craft beer, sun, people watching - the moment approaches perfection. excellent staff. unbelievable views. very child friendly. luxury service with a laid back feel. Beautiful setting. Nice light options. Parking lot is far and dark at night. Family vacation.... had wonderful meals and great drinks poolside and at the table. Millie was the best server by far!!!! Would not honor our lunch reservation made on open table. We were unable to dine there. Before 6pm, you must call them directly. Lovely place! Highly recommended for any occasion! Made a special trip from our hotel. Once we arrived the setting was beautiful. Although there was a substantial serving staff we were not greeted by our waiter for 15 minutes. The orders were very slow and our 22 month old granddaughter's meal which we were told by our server was free as stated on the menu, was charged as we were not advised by our server that this only applied to members. The server apologized and indicated he would talk to the manager. We were never advised of the outcome and paid the charge. The server forgot our granddaughter's milk. The service was not up to the Ritz's standard to which we've been accustomed. The Mojitos could have been better. The mint leaves were minimun and kind of brownish. We stayed at the beautiful Ritz Carlton resort at Dorado beach in Puerto Rico and were so excited to experience all that the resort had to offer. The views of the ocean are magnificent and the staff clearly cared about our experience - they were friendly and kind. Sadly, the food was not good. The flavors were barely tolerable. The meats were over cooked and the couscous very dry. We shared the chicken Mediterranean family dish and it came with some type of lamb sausage that non of us could eat. My father asked for an off Keanu chicken breast ( should be hard to get this wrong) but it was over cooked and dry. My daughter ordered the seafood pasta and she did enjoy her meal. We ordered lemon aid and it was like a contain mix from the bar. Sadly, we have to give this review because this was an extremely expensive meal and we were disappointed . The people and the location can not be beat, but the food is barely eatable . We had a 1:45pm Reservation on Saturday for a party of 5. We ordered almost immediately. No special orders or requests. Straight from the menu. We waited almost 2 hours for our food. My son had to get an apple and some oranges from the pool area to hand out to our guests. After 90 minutes the waitress was truly embarrassed and brought some salsa and chips to the table. It’s a beautiful restaurant in a great location, but at these price points and wait times, it’s really a crime. Great service and food. It was a last minute reservation and the experience was great. This is a great destination waterfront restaurant. The food and service is extraordinary....our server was tremendous! Currently, the restaurant is opens only for the Dorado Beach members. However, the restaurant's manager allowed enter us an eat. We had a great time!!! Consistent good food and service. Great view. Perfect for sunset! Great for a date or a big group. #1: When my husband sat down in his chair, it broke and he fell to the ground. I had to go find someone to tell them, he wasn't hurt or anything, but we had to grab our own chair from another table while the staff (who eventually came over) just kind of looked at us in amazement and disbelief that the chair had broken. Manager came later and apologized, all good. #2: We ordered a fish dish and asked for them not to put the CHORIZO that was included. They did not leave it out, so we sent it back and had to wait quite a while for the replacement. #3: There was nothing vegetarian on the menu, so the waiter said they could do a veggie pasta and even offered that it could be made vegan if we wanted that, which I did as I am lactose intolerant. So the only thing that was a change from the vegetarian to the vegan was to leave off the shaved cheese on the top. It was dark, and I didn't notice the cheese until I was about halfway through. I decided to go ahead and finish it, because I was hungry and I didn't want to have to wait for yet another dish. We were very patient and friendly about all three of these issues, but we expected that they would have comped one of the dishes or thrown in a free dessert or something - we spent $250 on dinner, after all. Maybe we should have pressed for a discount, but I wouldn't think you would have to when dining at The Ritz. It soured our experience, and made us regret spending that much on dinner. Next time, I would just go to the Barlovento Beach Grill (on property, also on the beach). Their prices are better and the view is just as nice. The restaurant was great! We had a tough time finding it as we drove through the Ritz property. Once we got to where we were going there wasn't anywhere to park and no valet. Once inside everything was 5 star! The ocean view was amazing and the fire pit was perfect as the sunset. The service was impeccable. We had multiple people devoted to our table. The food was great including a duck breast Special with potatoes and carrots with a wine reduction! We split the Creme Brûlée and Churros because we couldn't decide and both were fantastic. The chef came out after our meal to speak with us and ensure it was good. We would go back in a heart beat. High end cuisine by the pool and the ocean! Great outdoor scene with awesome cocktails and flavor. Highly recommended. We went for our anniversary. View was awesome, romantic. Personnel was very courteous. We got complimentary anniversary drinks and dessert, thumbs up. The octopus was the best we ever had. Chef came and talk to us, super nice. We will definitely recommend. Overall experience was excellent. The shrimp was overlooked. The dessert heavenly. Lovely restaurant, great food and service. A bit on the pricey side but that's to be expected for the location. Overall a great experience for the 7 of us. Definitely recommend. Amazing view and outstanding food! We enjoyed the sound of the ocean and warm breeze. Definitely a beautiful experience! Excellent service and delicious food, particularly the ahi tuna a arugula salad. Excellent ambiance and service. Pricey but when all things considered, worth it. Try the champagne mojito - excellent. Beautiful location and atmosphere and our service and food was better here than at the other beautiful outdoor restaurant at the Ritz, Positivo. However, the food was still nothing special so it seems like another missed opportunity for such a beautiful location and atmosphere. The wild mushrooms side was the favorite dish for our table and the mocha dessert was good too. 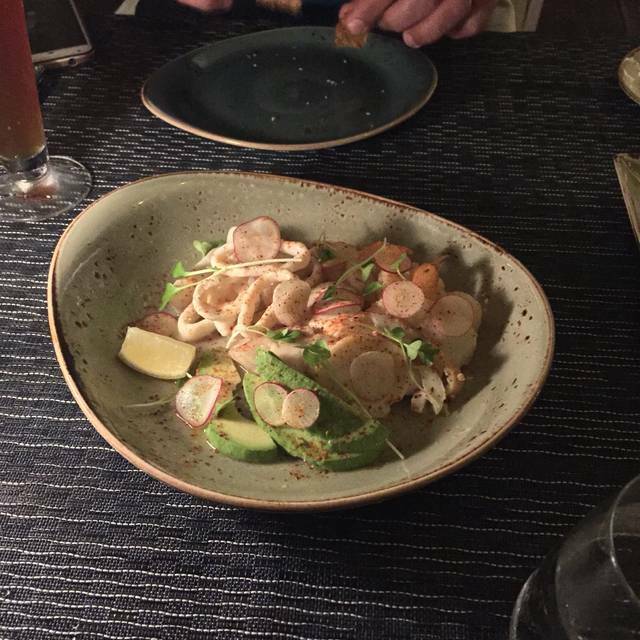 We stayed at the Ritz on vacation and had 2 great dinners at Encanto. The service was warm, friendly and professional... The open air dining with the waves crashing in the background added beautifully to the whole experience! The food was varied and delicious! It's a must try! View from restaurant is absolutely stunning! Gorgeous location! Staff was polite. Food was good. But, the mosquitos absolutely devoured us during dinner! 😁 Need to manage the mosquito problem ASAP! We are still itching from this scenic dinner! Great views and sunset. Great service and delicious food. Great special occasion spot. Encanto is a gorgeous beachside restaurant with top notch cuisine at the incomparable Dorado Beach Resort. Not to be missed! The ambiance and location is what really stands out about this restaurant. Nothing beats the sound of the sea as you relax and dine. Good food, good view but the service needs improvement badly. Our group of eight old friends rented a house in the area and kicked off our time there with dinner at Encanta. Sitting outside on a beautiful evening, within earshot of crashing waves, enjoying delicious food and drink, was a spectacular way to start our trip. Everyone was very pleased with their meals. Prices are a bit steep but that applies to everything within the Dorado Beach complex. At a table facing the ocean in an open-air restaurant. Light ocean breeze keeping your cool. Cocktail in hand - food to arrive. Welcome to paradise!!!! It doesn't get much better than this. We have been here several times and each time the staff and service have been outstanding. The food is wonderful. Our last visit was for my wife's birthday, and they brought her a complimentary dessert plate that was delicious. Outstanding outdoor setting. Very relaxing. Food was good, not great. Should be better for Ritz Carlton. St Regis in PR has better restaurants. Una experiencia única, fue un conjunto entre la comida, el ambiente, el servicio extraordinario que hicieron de mi noche inolvidable. We loved every detail. They have the highest standards in all elements of dining. We were there for the most wonderful Valentine's dinner. Well worth the $. I thought the food was pretty great for a hotel, beach-side restaurant.